Chapel, and from that time the homage and veneration offered to Mary under the title of "OUR LADY OF PROMPT SUCCOR" has been constantly growing in our city and state and spreading far and wide allover the United States. It does not come within the sphere of this brief sketch to relate all the favors, both spiritual and temporal, wrought through the intercession of Our Lady of Prompt Succor during the past one hundred years and more. The Chronicles of the Ursuline Convent sum up these graces by saying: "Under this title,the Most Blessed Virgin has so often manifested her power and goodness, that the Religious have unbounded confidence in her." Two historical facts are especially worthy of notice here: the fire in 1812, and the Battle of New Orleans in 1815. Devotion to Our Lady of Prompt Succor was only beginning to be known in New Orleans when, in 1812, a terrible fire ravaged the city. The wind rapidly drove the flames toward the convent, and the danger being imminent an order was given to leave the convent. Just then, Sr. Anthony placed a small statue of Our Lady of Prompt Succor on a window sill facing the fire, and Mother St. Michel prayed aloud: "Our Lady of Prompt Succor, we are lost, unless you hasten to our help." Instantaneously, the wind changed, the convent and environs were out of danger, and the flames extinguished. Witnesses of this inexplicable incident cried out unanimously: "Our Lady of Prompt Succor has saved us!" Ursulines has been faithfully kept throughout these long years. At the request of Their Excellencies Most Reverend John William Shaw, Archbishop of New Orleans; Most Reverend Cornelius Van de Ven, Bishop of Alexandria; and Most Reverend Jules B. Jeanmard, Bishop of Lafayette; in a decree rendered on the thirteenth day of June, 1928, by the Sacred Congregation of Rites, the Holy See approved and confirmed the choice of Our Lady of Prompt Succor as the Principal Patroness of the City of New Orleans and of the State of Louisiana, conceding at the same time each and all of the liturgical privileges proper to the principal patrons of places. Opening Prayer to Our Lady Oh, Immaculate Heart! Help us to conquer the menace of evil, which so easily takes root in the hearts of the people of today, and whose immeasurable effects already weigh down upon our modern world and seem to block the paths towards the future! When we wish to obtain some special favor through the intercession of Our Blessed Lady, the first disposition to bring to prayer is the humble recognition of our unworthiness, for it is the prayer of the contrite and humble heart that rises to the very throne of God. Our Lady of Prompt Succor, you are after Jesus our only hope. O Most Holy Virgin, whose merits have raised you high above angel choirs to the very throne of the Eternal and whose foot crushed the head of the infernal serpent, you are strong against the enemies of our salvation. O Mother of God, you are our Mediatrix most kind and loving. Hasten, then, to our help, and as you did once save your beloved City from ravaging flames and our Country from an alien foe, do now have pity on our misery, and obtain for us the graces we beg of you. Deliver us from the wiles of Satan, assist us in the many trials which beset our path in this valley of tears, and be to us truly Our Lady of Prompt Succor now and especially at the hour of our death. Amen. The Our Father, Hail Mary, and Glory be to the Father may be added, with the Litany of Our Lady of Prompt Succor and the prayer "O Mary, Mother of God". Filial resignation to God's Holy Will is the second disposition required for the obtaining of special graces. This disposition is especially necessary when we ask for temporal favors, for we cannot be certain whether they are conducive to our salvation or not. Our Lady of Prompt Succor, O Virgin most pure and Mother of the Word Incarnate, you are the dispenser of all graces and the refuge of poor sinners. With lively faith and unbounded confidence we have recourse to your maternal love and we beg you to obtain from your Divine Son the favors we now implore (here name the special favor desired). With filial trust we place our hearts under your motherly care beseeching you to obtain for us the all-important grace of perfect conformity to God's Will, and, O Mary, show yourself to be OUR LADY OF PROMPT SUCCOR, especially at the hour of our death. Amen. Our Father, etc., as on first day. A profound respect for the exalted dignity and sublime prerogatives of Mary is an excellent means to draw down upon us Heaven's choicest blessings. Our Lady of Prompt Succor, O Mary Immaculate, you are the model of all virtues, the path by which we go to Jesus, the mysterious channel through which divine favors are imparted to us. You have such power over the Heart of Jesus, hasten to our assistance and obtain our earnest request (here name the favor desired). In you, O Mary, we put our trust, let it not be said that our hopes have been frustrated. O Mother most chaste, be our strength against temptation, our help in danger, our consolation in sorrow, but especially be OUR LADY OF PROMPT SUCCOR at the hour of our death. Amen. A filial eagerness in striving to fathom the treasures of holiness contained in the heart of Mary, the most loving and lovable of mothers, is another means of obtaining Our Lady's special protection. Our Lady of Prompt Succor, living temple of the Holy Spirit and Queen of Heaven and earth, behold us prostrate at your feet to offer you the filial homage of our hearts, to thank you for the innumerable favors you have obtained for us, and to implore, through your all-powerful intercession, the graces we need, especially (here specify the favor desired). O Mary, be truly to us "Mary," that is, our shield against the darts of temptation, our solace in the midst of trials and afflictions, our firm hope, sweet consolation, and PROMPT SUCCOR at the hour of our death. Amen. One of the surest means to acquire a special right to the protection of Mary is to keep ourselves in the state of grace and endeavor to please her by imitating her virtues. Our Lady of Prompt Succor, Virgin most powerful and Mirror of Justice, who offered yourself totally to God for the perfect accomplishment of His Holy Will, make us generous in sacrifice. We have recourse to you to obtain the graces we need, especially (here name the favor desired). O Mary, Our Lady of Prompt Succor, heavenly protectress of souls devoted to your Divine Son, deign to bless us each day of our mortal pilgrimage, cast upon us your eyes of mercy, and after our exile, show unto us Jesus, your Son and our Brother. Amen. A tender love for Mary is another efficacious means of obtaining her favors. Since love can be requited only by love, what should not be our sentiments of filial affection for so generous and loving a Mother? O Mary, Our Lady of Prompt Succor, bright Star of the Sea shining upon life's stormy ocean, we implore your speedy help especially to obtain (here specify the desired favor). Shining Star of our tempest-tossed souls, lovingly guide us among temptation's heaving billows and treacherous shoals, and lead us safely into eternity's peaceful harbor. O sweetest of mothers, we seek your PROMPT SUCCOR now and at the hour of our death. Amen. Mary's love for us is tender and generous. Our love for her should be characterized by deep gratitude, filial confidence, and ardent zeal. We should endeavor, by good example and the spirit of sacrifice, to propagate devotion to her under her sweet title of PROMPT SUCCOR. your ears to our earnest supplications; rather hasten to our help now and at the hour of our death. Amen. Confidence is an excellent and necessary means for obtaining Mary's protection. Our Lady of Prompt Succor will bestow favors upon us in proportion to our filial trust in her all-powerful intercession. Our Lady of Prompt Succor, sanctuary of every virtue, who was chosen among all women to be the Mother of our Redeemer, be our advocate and protectress. To you do we raise our hearts and hands imploring your powerful intercession to obtain the favors we ask, especially (here mention the favor desired). Assist us by your mediation, O Mary, that your Divine Son may shower His blessings upon us now and at the moment of our death. Amen. Mary became our Mother on Calvary's crest. We are the children of her tears and sorrows. On this last day of our novena, let us take the resolution ever to foster a true and tender devotion to our Immaculate Mother of Prompt Succor, to cast all our cares and anxieties into her maternal heart. Our confidence will not remain unrewarded. Our Lady of Prompt Succor, Queen of the Universe and Sovereign full of kindness, you are the advocate of sinners, a haven of safety to the shipwrecked, the health of the sick and infirm, the consolation of the afflicted, the refuge and salvation of all on earth. O Mary, grant us, we beseech you, the help of your prayers to obtain the graces we implore, and in particular (here name the favor desired). Let your maternal heart be touched by our misery; hasten to our assistance and be to us, now and at the hour of our death, OUR LADY OF PROMPT SUCCOR. Amen. (For private recitation only) Lord, have mercy on us. Mother of the Infant Jesus, pray for us. Our Lady of Prompt Succor, pray for us. Our Lady of Prompt Succor of all who invoke you with confidence, pray for us. Our Lady of Prompt Succor of all who are devout toward the Infant Jesus, pray for us. Our Lady of Prompt Succor for obtaining a lively faith, pray for us. Our Lady of Prompt Succor for sustaining the hope of Christians, pray for us. 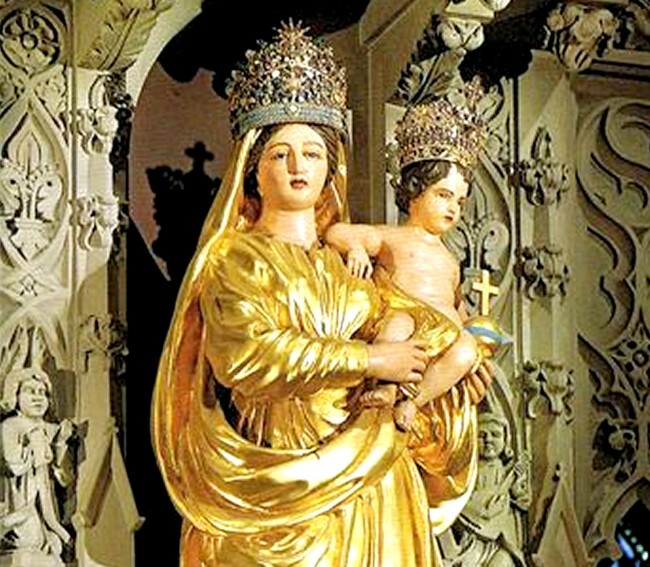 Our Lady of Prompt Succor for obtaining and persevering in charity, pray for us. Our Lady of Prompt Succor for observing the law of God, pray for us. Our Lady of Prompt Succor for observing perseverance in virtue and good works, pray for us. Our Lady of Prompt Succor in every spiritual necessity, pray for us. Our Lady of Prompt Succor against the revolt of self-will, pray for us. Our Lady of Prompt Succor in the occasion of sin, pray for us. Our Lady of Prompt Succor in every temptation, pray for us. Our Lady of Prompt Succor against the evil spirit, pray for us. Our Lady of Prompt Succor for obtaining contrition, pray for us. Our Lady of Prompt Succor of those wishing to re-enter the path of salvation, pray for us. Our Lady of Prompt Succor for the conversion of sinners, pray for us. Our Lady of Prompt Succor in every temporal necessity, pray for us. Our Lady of Prompt Succor in every affliction, pray for us. Our Lady of Prompt Succor of afflicted families, pray for us. Our Lady of Prompt Succor of the sick and the poor, pray for us. Our Lady of Prompt Succor against contagious diseases and epidemics, pray for us. Our Lady of Prompt Succor in every accident, pray for us. Our Lady of Prompt Succor against destruction by fire, pray for us. Our Lady of Prompt Succor against lightning and tempest, pray for us. Our Lady of Prompt Succor against destruction by flood, pray for us. Our Lady of Prompt Succor of travelers, pray for us. Our Lady of Prompt Succor of navigators, pray for us. Our Lady of Prompt Succor of the shipwrecked, pray for us. Our Lady of Prompt Succor against the enemies of our country, pray for us. Our Lady of Prompt Succor in time of war, pray for us. Our Lady of Prompt Succor of those aspiring to the Holy Priesthood and the religious life, pray for us. Our Lady of Prompt Succor of laborers in the Lord's vineyard, pray for us. Our Lady of Prompt Succor of missionaries who spread the faith, pray for us. Our Lady of Prompt Succor of our Holy Father the Pope, pray for us. Our Lady of Prompt Succor for those searching for the faith, pray for us. Our Lady of Prompt Succor against the enemies of the Church, pray for us. Our Lady of Prompt Succor at the hour of death, pray for us. Our Lady of Prompt Succor for the deliverance of the souls in Purgatory, pray for us. O Almighty and Eternal God! Who sees us surrounded by so many dangers and miseries, grant in Your infinite goodness that the Blessed Virgin Mary, Mother of Your Divine Son, may defend us from the evil spirit and protect us against all adversities, that always, and with PROMPT SUCCOR, she may deliver us from every evil of soul and body, and safely guide us to the kingdom of heaven, through the merits of Our Lord Jesus Christ, Your Son, Who lives and reigns with You in the unity of the Holy Spirit, one God, world without end. Amen. OUR LADY OF PROMPT SUCCOR O, Mary, Mother of God, who, amidst the tribulations of the world, watches over us and over the Church of your Son, be to us and to the Church truly OUR LADY OF PROMPT SUCCOR, make haste to help us in all our necessities, that in this fleeting life you may be our succor, and obtain for us (here ask the particular favor you desire). Help us to gain life everlasting through the merits of Jesus, your Son, our Lord and Redeemer. Amen.